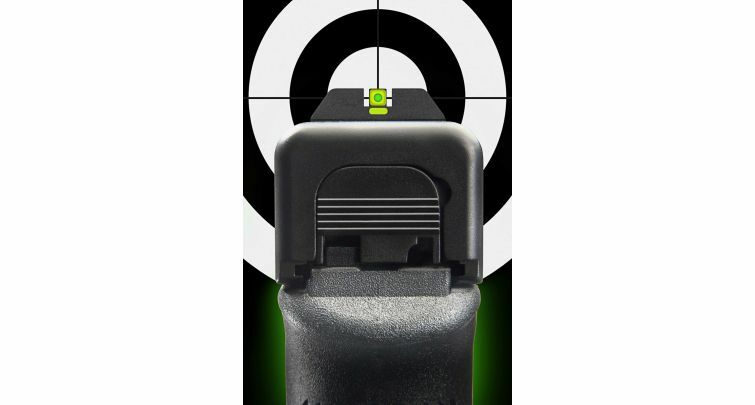 Ready to shoot faster and more accurately? We’ll take a look at eye dominance, sight picture, & trigger pull to finish off shooting fundamentals. Eyes can be dominant just as with hands and legs and an important part of shooting accurately is knowing which eye is dominant. The vast majority of people have dominant eyes that match their dominant hands, but a few (myself included) are cross-dominant. *Note* Got a lot of requests for where we got our bleeding target. Check out Triumph Systems ($20). Not down for our sweet video right now? 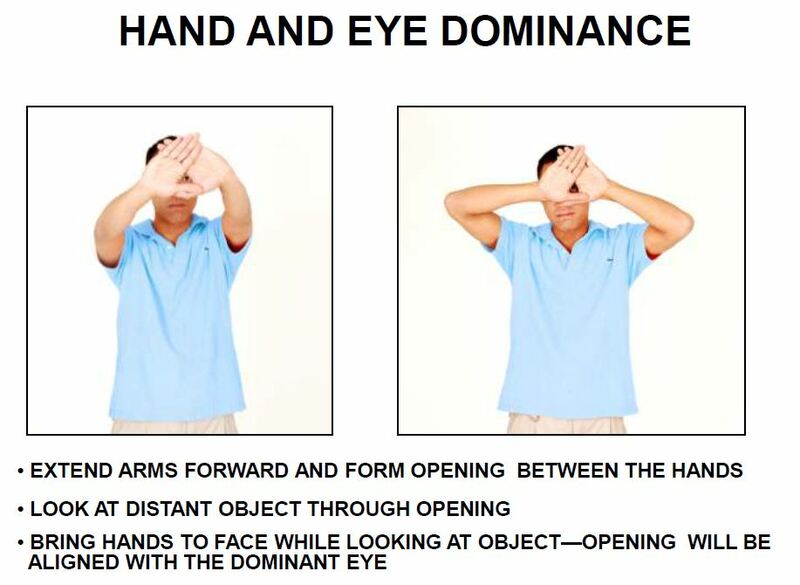 It will be easier for beginners to start with closing one eye and using their dominant eye. However, as you progress, you will likely find yourself shooting better with both eyes open. It will take a while to train your brain but you’ll see benefits such as increased depth perception and orientation. Your eye-dominance can often dictate which stance you like better. For me, since I’m left-eye dominant and right hand dominant, I prefer the Modified Weaver/Chapman stance since it puts my left-eye more behind the sights. Aim a gun: Just point and shoot, right? In the grand scheme of things, yes, that’s pretty much it. But proper sight picture is one of those fundamental things that makes the difference between a shooter and someone that just plays with guns. The sight picture is everything you see with your sights and your target. There are several different types of sights but most firearms will have a notch or circular rear sight with a post or bead as the front sight. Also very common is the three dot sight. All of them, no matter what their setup, work on the same principle. The front sight can be many things but usually is more contrasting than the rear sight to draw in the eyes. You’ll then want to make sure you have proper sight alignment. This will vary on your sights but mostly will require you to line up your sights. Where you’ll be hitting also depends on personal preference or more likely…how your gun is set up from the factory. Some people like the first one which is called the “6 o’clock hold” where you line up the bottom of the target with the top of the front sight so you can hit the middle of the target. The second image is the most traditional and called “point of aim, point of impact” where you line up the top of the front sight with where you want to hit. The last image is where you cover where you want to hit with the center of your front sight dot. The final question is where to focus with your eyes. There are three choices—the rear sight, the front sight, or the target. The correct plane to focus on is the front sight, since the bullet will go where the front sight is pointing. Every expert in the world will tell you that you will get the best results by keeping the front sight in focus while pulling the trigger as it will really help you to keep the gun steady. This is the main reason why a lot of front sights are distinctly colored. When you’re correctly focusing on the front sight, the rear sight and target will appear blurry. The best flow is to first focus on the target and loosely line up the dots on to it. At this point change your focus to that front sight and line it up with the rear sights as well as the blurred out target. As you slowly squeeze the trigger, focus on keeping that front sight as stationary as humanly possible. 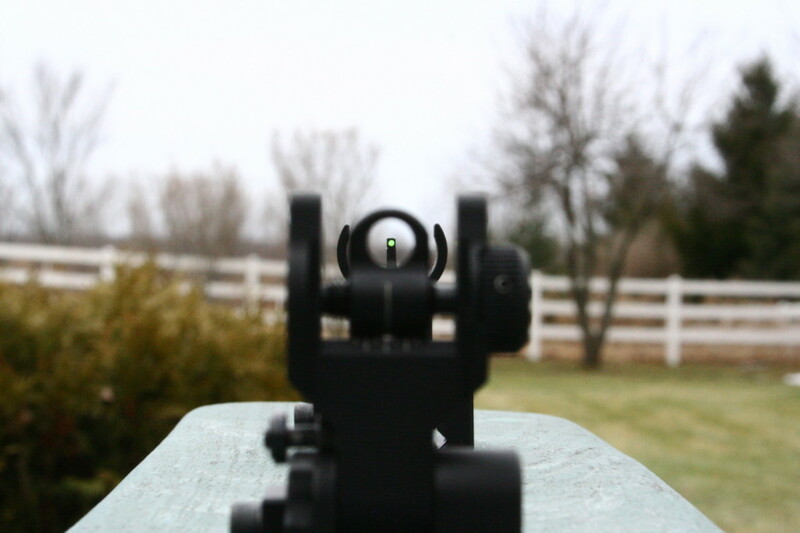 With that front sight in focus and stationary, your shots will improve greatly. 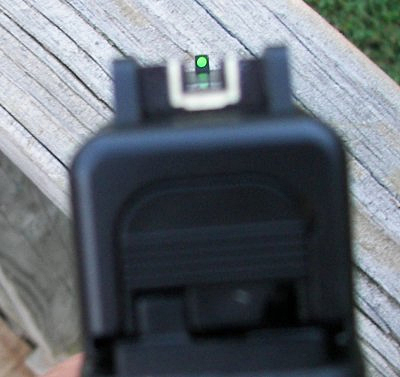 There are also electronic sights that allow for both eyes to be open and focus only on one object. 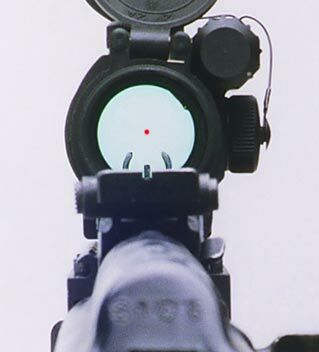 Here is an example of a typical “red dot” sight made by Aimpoint. In the end, it’s all about keeping your sights lined up perfectly. You should consider perfection a minimal standard in this case. Why? Because of an old dude named Pythagoras. WARNING: MATH LESSON INCOMING! TAKE COVER NOW! In a perfect world, the gun would form a straight line between the barrel and the desired target. In reality, you’re forming a right angled triangle between the desired target, the actual target and the barrel. The goal is to make the angle by the barrel as close to 0º as possible. Even though, at 10 yards, even a 0.5º angle can throw the bullet 3 inches off target. In this example: Tan(0.5º) x 30 feet = .26 feet or just a bit over 3 inches. If you increase the distance but keep the angle the same, you can see just how important keeping your sights lined up actually is. Well that’s eye dominance and sight picture in a nutshell. Let us know if this article helped you out and then check out what’s next in our Beginner’s Guide to Guns. Or…are you looking for a full handgun course? We created it just for you…full of only the important stuff and without the attitude. I know this post is a little old, but glad to see there are others with the cross-eye dominance. I am about to begin competition shooting and chose carry optics so that I can work on shooting with both eyes open. I will try the modified stance next time I am at the range. Hi! I’m really enjoying all the articles–thank you so much for what you do! I’m also cross-dominate (right hand, left eye). Does this affect you when shooting rifles? I can’t seem to get a comfortable position being cross-dominate and shooting rifles. You’re so welcome, Sara! It does affect shooting rifles with a scope since there’s not really a position to enable opposite hand/eye. You can try using your weak hand and strong eye. Or use a red dot or holographic sight where you can keep both eyes open. Is it possible to not have a dominant eye? It seems like my left eye may be slightly dominant, but it is so small that the above mentioned test has me testing positive for both my right and left eye. For example, if I was to aim a gun at a target with both eyes open, both sights that I am seeing look equally strong. Any input on this would be appreciated. Take advantage! I would practice with the eye that is the same as your dominant hand. That way you don’t have to change your stance. Great article as usually. Keep up the good work guys. I’ve always been left-eye dominant and sort of knew it intuitively. 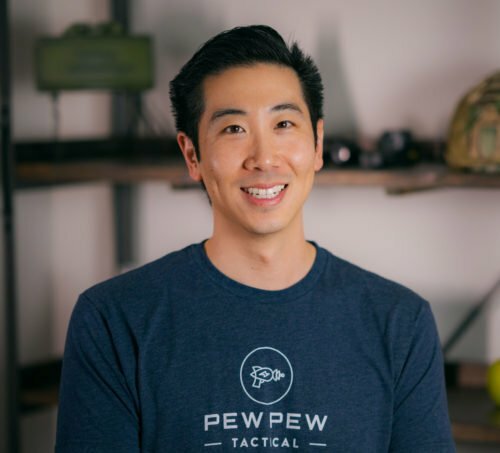 This article not only confirmed it for me, but gave me great advice to use at the range. I tried the modified Weaver/Chapman stance and shot lights out! My buddies and I played target poker on one those targets with prints of playing cards on them, and I won! Three Aces. Awesome, glad to help out my right-handed left-eyed brethren!